Legg-Calve-Perthes disease is an uncommon condition (1 in 5,000) that affects one, or sometimes both, hips of a child between the ages of 3 and 15. The disease is named after Arthur Legg, Jacques Calve, and Georg Perthes, who all independently identified the disease in the early part of the 20th century, shortly after x-ray diagnostic tools became available. The disease is commonly known as Perthes or simply by the abbreviation LCPD. In adults, there is a similar condition called avascular necrosis (AVN) or osteonecrosis of the hip. With both of these conditions, and for unknown reasons, the femoral head loses part (or all) of its blood supply and part (or all) of the bone of the femoral head dies. This dead bone is called necrotic bone. The actual loss of blood circulation is an acute event and is the root cause of Perthes. This loss of blood happens without the patient’s awareness and there are no obvious symptoms. The first symptoms for Perthes do not tend to develop for several months after the initial loss of blood episode. Once the femoral head dies, it takes roughly 1–2 years for the body to absorb the dead bone and then 1–3 additional years as the body attempts to regrow and reform the femoral head. This lengthy timeline and the body’s responses form what is called the “natural history” of Perthes disease. 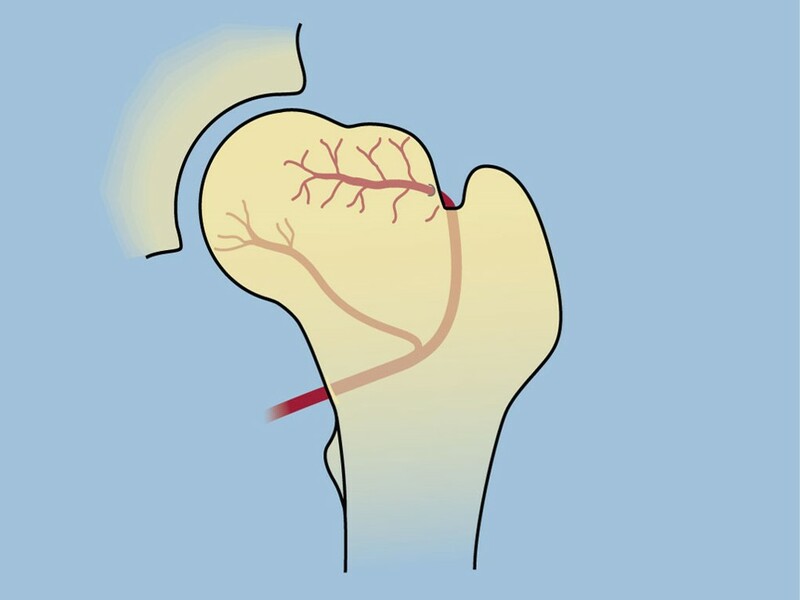 During the 8 to 18 months after the initial loss of blood supply, the disease progresses due to the body’s normal repair mechanisms to remove and replace the dead bone of the femoral head. During this repair process, the femoral head may be sufficiently weakened such that it collapses, leading to deformation of the joint surface. This deformation creates a non-spherical femoral head inside of a spherical socket and ultimately leads to joint stiffness, arthritis, and pain. How does a normal repair process designed to rid the body of dead bone go so awry? To understand this, it is important to understand the normal repair process. The femoral head is made up of a core of bone surrounded by cartilage. The cartilage of the femoral head receives its oxygen and nutrition from the fluid in the hip joint. The bone in the femoral head receives its oxygen and nutrition from blood vessels that enter the femoral neck from outside the bone. The femoral neck is separated from the rest of the femur bone by the growth plate of the upper femur. When there is blockage or damage to these blood vessels, the bone in the femoral head dies due to loss of oxygen and nutrition. The cartilage on the outside of the femoral head does not die since it gets its oxygen and nutrition by diffusion from the fluid inside the hip joint. The dead bone is removed by special bone-eating cells called osteoclasts. New living bone is produced by special bone-making cells called osteoblasts. As the dead bone is removed from the femoral head, the support of the cartilage of the joint is weakened. If the surrounding cartilage structure is thick and strong enough, there will be time for new bone to be deposited and replace the removed bone, resulting in no change in the shape of the femoral head. If too much support is removed and the surrounding cartilage cannot withstand the load, then the weight-bearing surface of the femoral head will slowly collapse and the normally spherical femoral head becomes flattened to an egg-shaped configuration. To help explain the collapsing process, compare the femoral head to the renovation of a building. Imagine an old building that, although still intact, has severely weakened internal support structures that must be replaced with new internal supports in order to prevent the roof from collapsing. If the “demolition team” removes some old support beams and the rest of the building structure can withstand this weakening, then the roof will not cave in and there will be enough time to replace the old support beams with new ones. If, however, too many of the old support beams are removed before they can be replaced, then the roof will cave in. A caved-in roof is hard to rebuild and unfortunately can lead to a deformed new roof, especially if the crashed roof has lots of weight on it, such as wet snow. Bringing this analogy back to the femoral head, the roof of the building is the hard, dense, outer surface of the femoral head that is called subcondral bone and supports the overlying cartilage of the femoral head. The supporting beams within the building are a low-density, honeycomb-shaped bone called trabecular bone that forms the core of the femoral head. The old supports are dead trabecular bone that died from a lack of blood supply and are eaten away by osteoclast cells. The new supports are the reforming trabecular bone installed by the osteoblast cells. The snow on the rooftop represents the body’s weight and muscle forces that continuously apply load through the hip joint, crushing and permanently deforming the weakened, fragile femoral head while it is trying to renovate its structure. The best results in Perthes occur when the roof of the femoral head does not collapse or when it only minimally deforms and when there is plenty of time to repair the damage, such as in a younger child. The worst results occur when the roof caves in badly and the older child doesn’t have adequate growing time to repair the damage. Unfortunately, if the roof deforms, the resulting egg-shaped femoral head is no longer spherical and therefore cannot move in all directions like a ball in a socket. This reduces the normal range-of-motion (ROM) of the hip joint. Furthermore, if the shape of the femoral head is mismatched with that of the socket (acetabulum) there will be abnormal wear and tear in the joint, leading first to stiffness, then pain, and eventually to loss of joint cartilage, known as arthritis. This early osteoarthritis often leads to total hip replacement (THR) as an adult as early as age 30, but more likely in the 40s or 50s, depending on the degree of deformation and joint shape mismatch left behind by the Perthes disease process. So why does Perthes occur? Unlike other joints in the body, the femoral head has a very unique but precarious blood supply where almost all the blood going to the femoral head is delivered by one main blood vessel system that must enter the femoral head by travelling across the femoral neck into the hip joint and finally into the head at its junction with the femoral neck. Since the hip joint is designed to permit motion in all planes, these blood vessels must move with the femoral head throughout its complete range-of-motion. In certain positions, these vessels may become trapped against the edge of the acetabulum. Moreover, certain mechanical positions of the leg may promote this trapping effect for prolonged periods of time. For example, prone sleeping on the belly with hips extended and toes pointed outward may restrict blood flow to the femoral head. Such underlying disease conditions also predispose the child to the much less common bilateral Perthes, where both the left and right femoral heads are affected. About 15% of children afflicted with Perthes in one hip will get it in the other hip.